Show off your most prized merchandise, like collectibles, antiques, gifts or trinkets in our Maple Metal Framed Upright Glass Display Case. 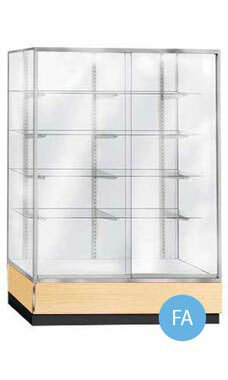 This wall unit has a variety of features that will provide you with class and elegance in your display presentation. The Maple melamine exterior laminate surfaces and recessed black kick-plate will match almost any store fixture. The wall unit display case contains a 3/4" slab end construction, brushed aluminum metal framing, 4 rows of adjustable 12" deep shelving, and front access glass sliding doors for easy access into the case. Providing you with ample space to display your inventory, the glass display case will serve your retail store for years to come. Wood crating for secure shipping is included in the price of the case. Optional light kit and lock available (sold separately). Overall Size: 72"H x 20"D x 70"L. Ready to ship.